In Azure Active Directory (Azure AD), you can use rules to determine group membership based on user or device properties. 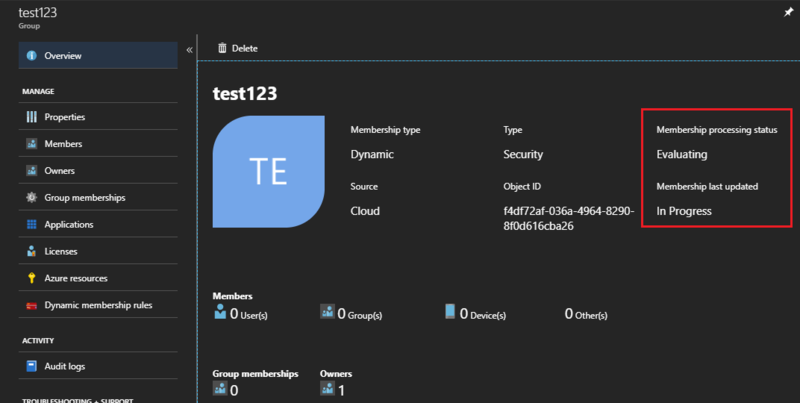 This article tells how to set up a rule for a dynamic group in the Azure portal. Dynamic membership is supported for security groups or Office 365 groups. When a group membership rule is applied, user and device attributes are evaluated for matches with the membership rule. When an attribute changes for a user or device, all dynamic group rules in the organization are processed for membership changes. Users and devices are added or removed if they meet the conditions for a group. 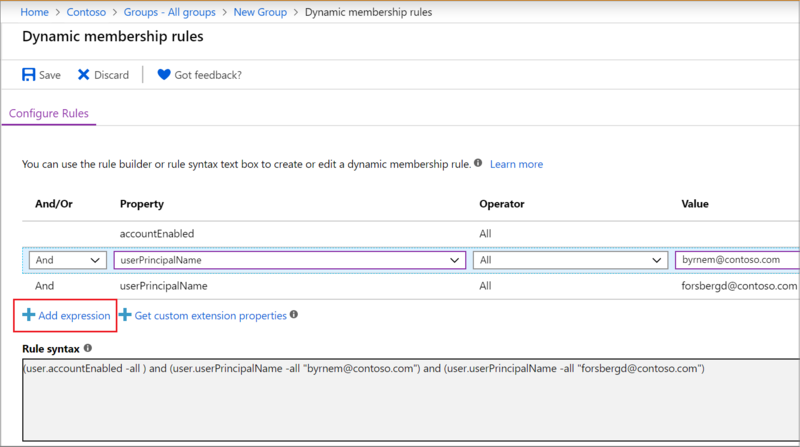 For examples of syntax, supported properties, operators, and values for a membership rule, see Dynamic membership rules for groups in Azure Active Directory. Sign in to the Azure AD admin center with an account that is in the Global administrator, Intune administrator, or User administrator role in the tenant. Select All groups, and select New group. On the Group page, enter a name and description for the new group. Select a Membership type for either users or devices, and then select Add dynamic query. You can use the rule builder to build a simple rule, or write a membership rule yourself. Enter the application ID, and then select Refresh properties. If the rule you entered isn't valid, an explanation of why the rule couldn't be processed is displayed in the upper-right corner of the portal. Read it carefully to understand how to fix the rule. When a new Office 365 group is created, a welcome notification is sent the users who are added to the group. Later, if any attributes of a user or device change, all dynamic group rules in the organization are processed for membership changes. Users who are added then also receive the welcome notification. You can turn off this behavior in Exchange PowerShell. You can see the membership processing status and the last updated date on the Overview page for the group. Evaluating: The group change has been received and the updates are being evaluated. Processing: Updates are being processed. Update complete: Processing has completed and all applicable updates have been made. Processing error: Processing couldn't be completed because of an error evaluating the membership rule. Update paused: Dynamic membership rule updates have been paused by the administrator. MembershipRuleProcessingState is set to “Paused”. <Date and time>: The last time the membership was updated. In Progress: Updates are currently in progress. Unknown: The last update time can't be retrieved. The group might be new. If an error occurs while processing the membership rule for a specific group, an alert is shown on the top of the Overview page for the group. If no pending dynamic membership updates can be processed for all the groups within the tenant for more then 24 hours, an alert is shown on the top of All groups. These articles provide additional information on groups in Azure Active Directory.